In the Mariupol sector, militants shelled ATO positions with mortars in the area of the Vodyane and Shyrokyne. They fired grenade launchers and small arms in the areas of Pavlopil, Hnutove, Krasnohorivka, Maryinka, Vodyane and Shyrokyne. An enemy IFV fired on Talakivka. Shyrokyne and Talakivka were under sniper fire. In the Luhansk sector, the enemy's 152-mm artillery shelled the positions outside Kalynovo-Popasna and Novozvanivka. It used 120- and 82-mm mortars near Zolote, Sentyanivka, Novozvanivka and Krymske. Militants also fired with grenade launchers and small arms on Novozvanivka and Novooleksandrivka. In the Donetsk sector, militants pounded Luhanske, Troyitske and Zaytseve with 120-mm and 82-mm mortars. The ATO positions outside Kamyanka, Luhanske, Zaytseve, Avdiyivka and Troyitske were attacked with grenade launchers and small arms. An enemy IFV shelled Luhanske. 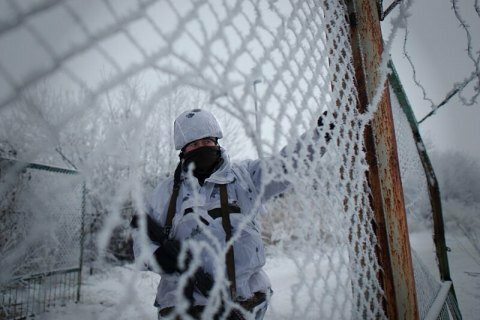 One Ukrainian soldier died and five others were wounded in combat in Donbas on Wednesday, 11 January.